Societal tensions, violence and civil war are a central part of the development process; indeed, to some societies an intrinsic component of their development experience. A literature in political science and sociology suggests that the presence of ethnic differences in society may have an important role to play in conflict. In this lecture, Ray provides an overview of some approaches to ethnic conflict. In particular, he introduces a measure of ethnic polarization, and argues that this measure is closely in line, conceptually, with the notion of ethnic difference that political scientists have described. He argues, moreover, that the empirical findings also agree with theories of ethnic conflict when polarization measures are used. Ray then turns to theory. Classical Marxism views economic class divisions as the main cause of social conflict. Yet, in line with the previous discussion, many of the conflicts observed today appear to be ethnic in nature. It appears that the "vertical" nature of class divisions is often dominated by the "horizontal" antagonisms across groups delineated by noneconomic markers. In the last part of his talk, Ray attempts to unify these views, by highlighting the perverse synergy of economic inequality within ethnic groups, and the role of this synergy in the salience of ethnic conflict. 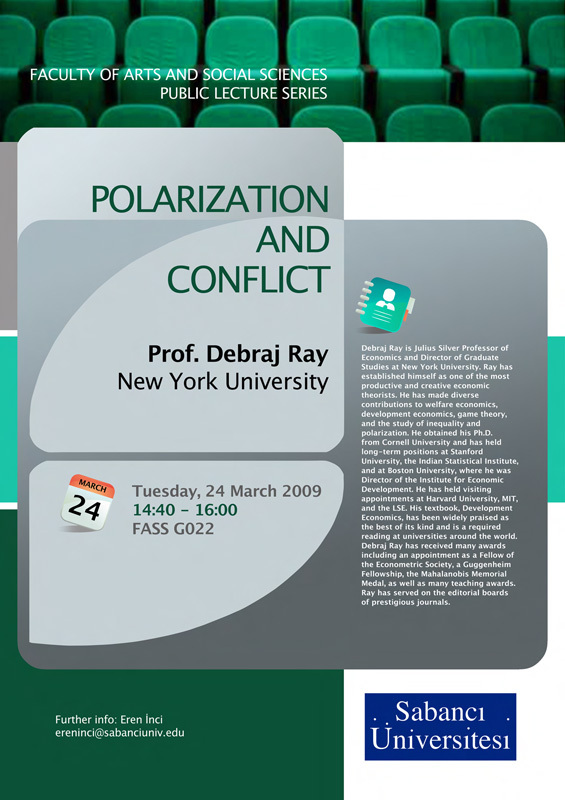 Debraj Ray is Julius Silver Professor of Economics and Director of Graduate Studies at New York University. Ray has established himself as one of the most productive and creative economic theorists. He has made diverse contributions to welfare economics, development economics, game theory, and the study of inequality and polarization. He obtained his Ph.D. from Cornell University and has held long-term positions at Stanford University, the Indian Statistical Institute, and at Boston University, where he was Director of the Institute for Economic Development. He has held visiting appointments at Harvard University, MIT, and the LSE. His textbook, Development Economics, has been widely praised as the best of its kind and is a required reading at universities around the world. Debraj Ray has received many awards including an appointment as a Fellow of the Econometric Society, a Guggenheim Fellowship, the Mahalanobis Memorial Medal, as well as many teaching awards. Ray has served on the editorial boards of prestigious journals.